New poster shows current fleet of Special Mission submarines based at Olenya Guba (Deer Bay) in the Arctic Circle. 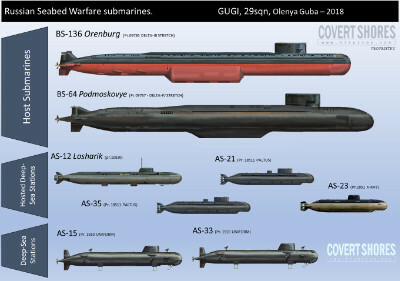 The submarines are operated by 29 Squadron of the Russian Navy on behalf of the Main Directorate of Deep-Sea Research - GUGI (Military Unit 40056). Two very large host submarines, based on modified DELTA-III/IV Class ballistic missile submarines, transport smaller 'Deep Sea Stations' to their targets. The smaller submarines are carried in special recesses under the keel of the host submarine. The nuclear-powered Deep Sea Stations are able to dive to depths of between 1,000 meters and 3,000 meters, in order to conduct operations on cables or devices on the seabed. Two older UNIFORM Class Deep Sea Stations (AGS) are designed to operate independently of the host submarines.